Here, the designer went the opposite way with the colors. She chose to make the furniture pop against a neutral gray and white striped backdrop. 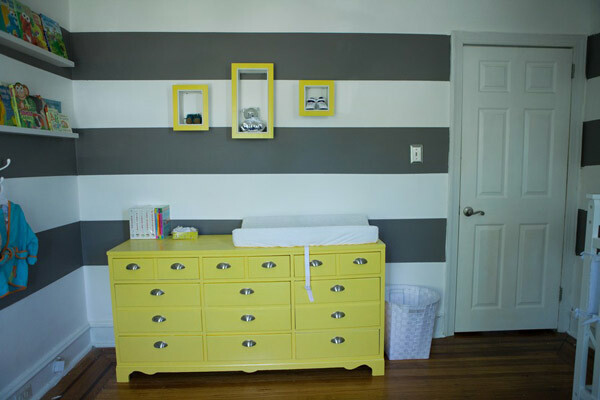 Go with matching creative wall decor like the yellow display frames in this nursery. 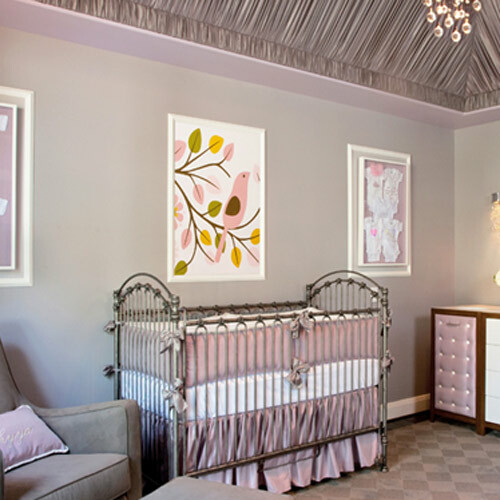 Are you bored of pink nurseries for girls but want a real girly color? Coral would be a great option for you! In this room, the designers kept the furniture, curtains, and carpet in the neutral antique silver/tan families. The coral wallpaper gets tied in with the coral accented monogram rug and bumper bows. Notice how the bedding and the rug are mostly white to keep the room feeling fresh and airy. Coordinate the walk-in closet with neutral carpet and baby pink walls. Add a touch of bright coral to bring in that pop. Double or triple up your hanging rods to maximize space. When choosing espresso or black furniture, some color is necessary to keep the nursery alive. This designer chose to go with furniture that matched the dark wood floors. 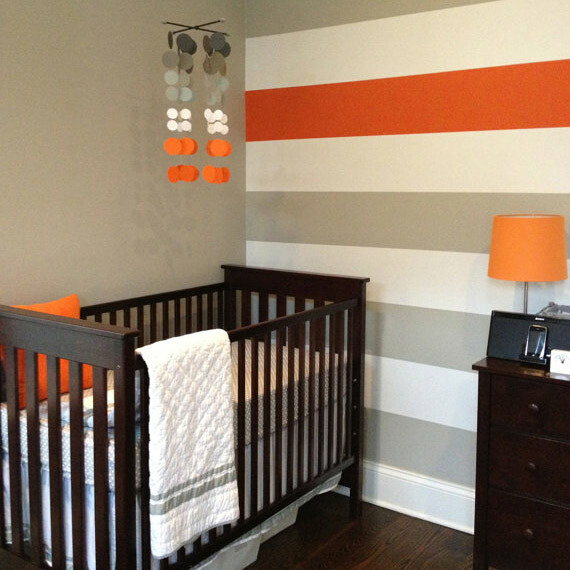 By adding one orange stripe between the grey and white stripes, the room takes on a whole new bright look. 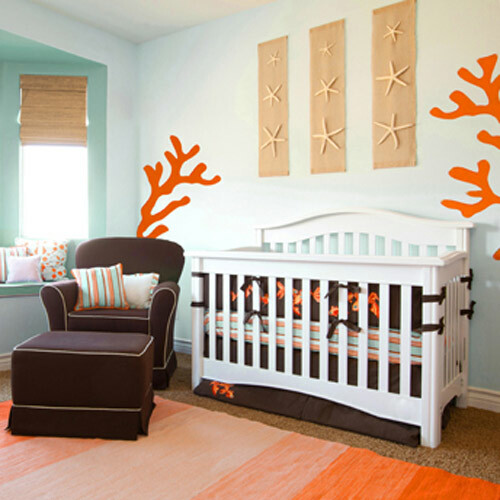 I love how the lamp, pillow, and mobile ties all the oranges together without ruining the nursery's simplicity. You can accomplish a great under the sea look with these colors instead of the standard nautical (red and blue) colors. Use a mix of baby blues, oranges, and neutrals. Notice how the glider, carpet, and wall hangings are all neutral colors so they don't take away from the touch of brightness. Look how this room is elegant but not overdone. Again the designers went with the neutral greys and popped in some lavender bedding and furniture accents. The adorable frames displaying baby undershirts look like an expensive wall hanging but are fairly easy to put together yourself. 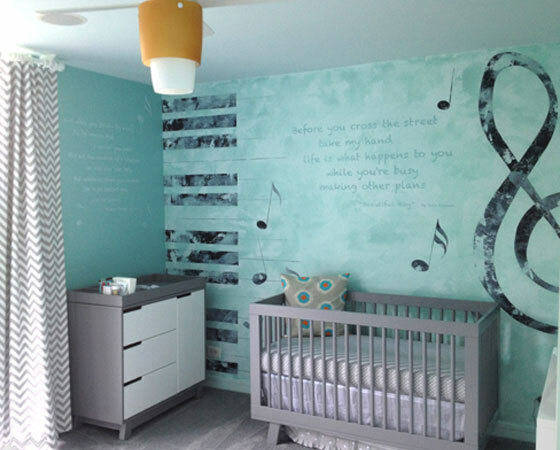 When making the wall the focal point of the nursery, grey out the furniture and window panels while making your wall stand out with some cool colored design. Tie the color in with a coordinating pillow and light fixture. In this room, the light fixture brings in an additional color. Create your color pop nursery and SUBMIT your photos. Our designers will choose a winner that will receive a $200 aBaby gift certificate.